There are 25 million meetings per day in the U.S. They’re a necessary part of doing business. But let’s face it, they aren’t the most popular part of the workday. In fact, executives consider more than 67% of meetings to be failures. Much of this lack of success is due to poorly planned agendas, distractions from mobile devices, and information that isn’t clear. Another culprit; 92% of people admit to multitasking during meetings. Whether you’re in the office or at the jobsite, you’re probably trying to do more with less. This puts extra pressure on meetings to be productive. Yet, managers often struggle to make meetings more inclusive and effective, and at the same time engage staff with increasingly shorter attention spans due to instant gratification afforded by technology. More and more, companies are starting to see the value in ditching their whiteboards and replacing them with large, interactive touch-screen computers to elevate meetings and make them a collaborative process. These are dynamic, full feature touch-screens powered by an internal computer. They provide a place for creative collaboration as well as the instant gratification that tech savvy staff craves. In fact, we use our own SKYSITE SmartScreens daily. With over 170 locations scattered across the states, as well as international locations, our challenge was how to connect our teams, keep interest during conference calls and elicit feedback to accelerate consensus. 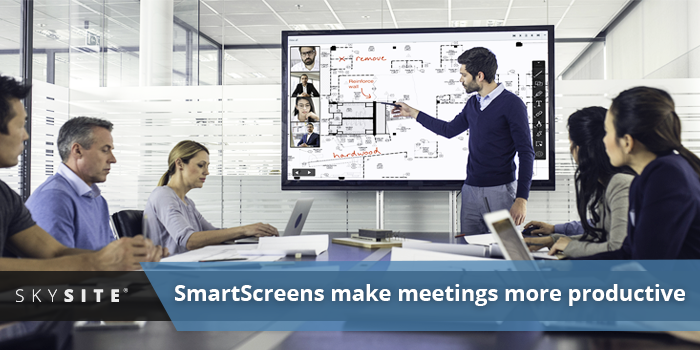 One of our main benefits of SmartScreens is enhanced video conferencing. This allows our teams across the globe to connect with each other. More than a voice on a conference call, video conferencing allows teams to see each other in their work environment. This visual cannot be underestimated. When coworkers aren’t anonymous it allows teams to build connections, see reactions and get non-verbal feedback. This, in turn, fosters better and more productive teamwork. And, being on video keeps people honest and focused on the meeting, not multitasking on email or other projects. File duplication and users unsure of which is the correct version. SmartScreens aren’t just for the office, the AEC industry is increasingly finding them a more valuable tool. At the jobsite, they can be used to easily view plans and assignments during a daily huddle. Updated documents can be marked up and saved in full view of workers, ensuring everyone is on the same page. Additionally, a General Contractor can have a meeting, in the office or field, where the architect and owner are visible to review and markup plans. Once again, everyone has the same information and is in sync. Don’t be a slide reader or lecture, you’ll bore your listeners. Encourage collaboration, questions and feedback. Capture decisions, action items and next steps. Make sure everyone understands these. Engage virtual attendees with questions, kudos or preassigned tasks. Don’t give handouts, they distract people from the discussion. Replace messy whiteboards with a SKYSITE SmartScreen. Preparation and participation make or break a meeting’s success. By using technology and following these tips you can capture decisions, action items and next steps, ensuring everyone knows what’s expected next.